Spend two nights in mountains on the outskirts of Rishikesh, engage in two sessions of thrilling river rafting and ride the twists and turns of the Ganges. With paddles in hand, you'll battle rapids rated grade II and III, as you navigate the raft over gurgling tides and waves of the river. In the evening, you can relax at a photogenic campsite, grab views of a crimson sunset and even try your hand at rock climbing and rappelling or head out for a short trek to a nearby haunted house. • Spend three days away from the city at a scenic campsite. 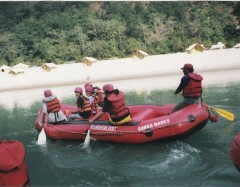 • Go rafting in Rishikesh down two stretches of the Ganges. Day 2 of rafting in Rishikesh: Go rafting! Wake up early in the morning for another encounter with the Ganges. After breakfast, you'll begin down another stretch of river rafting, battling rapids like Micky, Golf Course, and Roller Coaster that are rated grade II and III, before pulling out of the water at Nim Beach. En route to the campsite, you can stop to try rock climbing and rappelling over the natural rock face of a mountain cliff. Overnight in tents at the Rishikesh campsite. You'll be accommodated in Swiss tents, equipped with comfortable beds with blankets and pillows. You'll have access to common washrooms at the campsite. Today's meal package includes breakfast, lunch, evening snacks and dinner.